Senior Shay Lari-Hosain feels fortunate to be able to spend his summers in Pakistan, performing meaningful outreach work under the direction of a recipient of a United Nations recognition award for the promotion of culture and peace. Especially since the recipient happens to be his grandmother. 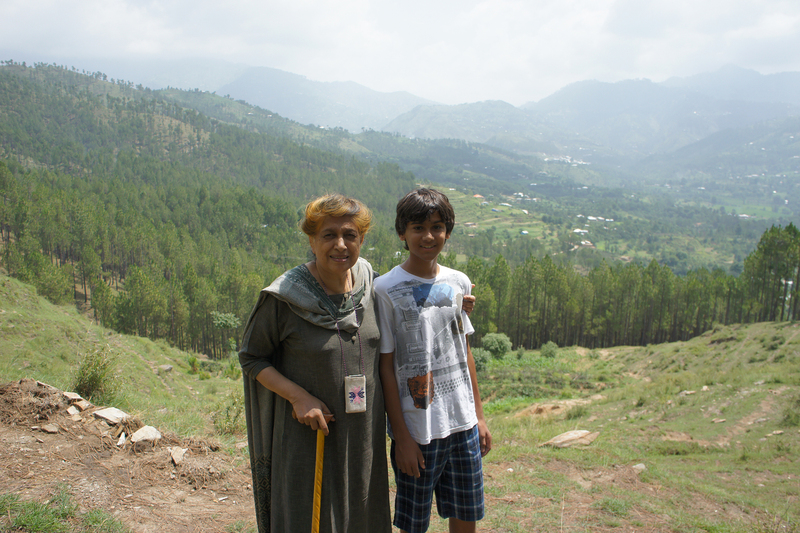 Every year, shortly after school lets out, Lari-Hosain heads off to work at the Heritage Foundation of Pakistan (HFP), a humanitarian organization co-founded by his grandmother, Yasmeen Lari. He speaks with pride of Lari, who made history as Pakistan’s first woman architect. Most recently, she was one of a few architects featured in an Architectural Digest article. In 2000, Lari retired from corporate practice and turned her attention to humanitarian work/poverty alleviation, Lari-Hosain explains. “That shift requires completely different types of architecture. Starting early on in her life, she was designing glass and metal corporate buildings and urban housing in Karachi … and now [she] designs environmentally sustainable, small housing units for completely different, rural settings,” he said. Lari co-founded the HFP in 1980 with her husband, noted historian Suhail Zaheer Lari. Her profile has been included among 60 women from around the world who have contributed the most toward the objectives of the United Nations Educational, Scientific and Cultural Organization (UNESCO). Last year, the Hilal-i-Imtiaz (The Crescent of Distinction) award was conferred on her by the government of Pakistan. “I’ve been working at her foundation since I was an elementary school kid,” said Lari-Hosain, who most recently has done extensive marketing work for HFP’s Karachi office. Lari-Hosain currently keeps busy as editor-in-chief of Wingspan, the upper school’s long-form magazine. Last February he brought his grandmother to Harker as a guest speaker, sharing her experiences with upper school journalists. She spoke about her work with education awareness programs, including women’s empowerment. She also shared stories about time spent training former militants, putting them on a different path to be more productive in rural society. “My grandmother also has spoken on multiple occasions in Geneva (at the UN). In the past, she taught seminars at MIT and Harvard on architecture,” noted Lari-Hosain. Lari-Hosain also worked to bring Al-Jazeera America’s “The Stream” co-host and Harker alumnus Wajahat Ali (MS ’94) to the upper school. Ali discussed his life as a Muslim-American during an assembly held on Sept. 19 in the gym. Lari-Hosain had the pleasure of introducing Ali during that assembly. Last spring Lari-Hosain interviewed Ali for a Wingspan story regarding issues that Muslim-Americans face. That article got picked up by a Pakistani paper called DAWN, the leading English newspaper in Pakistan. Lari-Hosain’s article is linked here online.